Me, Beloved, and friends celebrated a Holiday’s party last Saturday. 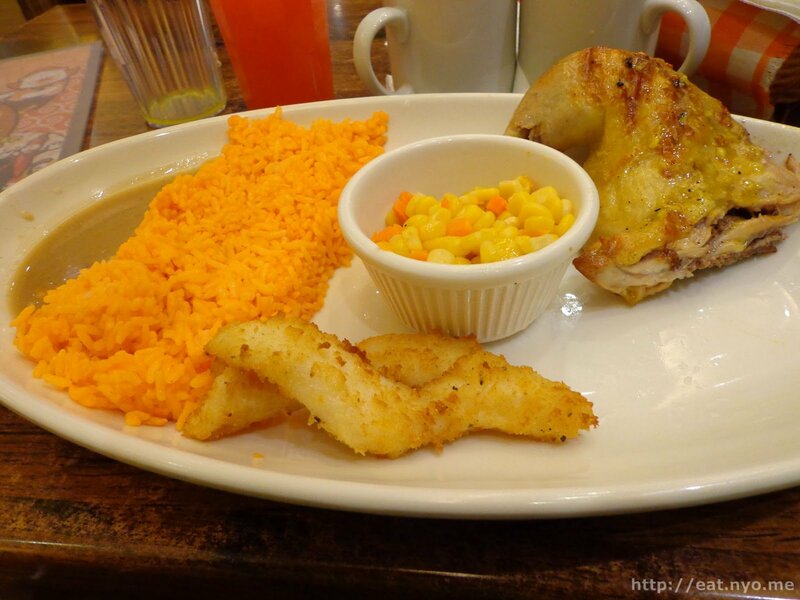 We met up at SM North EDSA and decided to have dinner at Peri-Peri. This is among the original food places that opened up when the new Annex building re-opened. Beloved and I never had the opportunity to try out this Portugese grilled chicken restaurant, but our friends did. Garnering no negative reviews, and with the fact that they offer unlimited soup and drinks for 49 Php, there was little hesitation from me. As I mentioned, this place serves grilled chicken. Apparently, “Peri-Peri” is the sauce they use to make this chicken. According to the menu, most of their stuff has some spiciness in it, but you can ask your chicken to be grilled mildly spicy, hot and spicy, or lemon garlicky. I concluded that the best value offerings are the 235 Php “Everyday Platters”, so I got their Everyday Platter B. Beloved got their Everyday Platter D. We also asked for the unlimited soup and drink add-on. 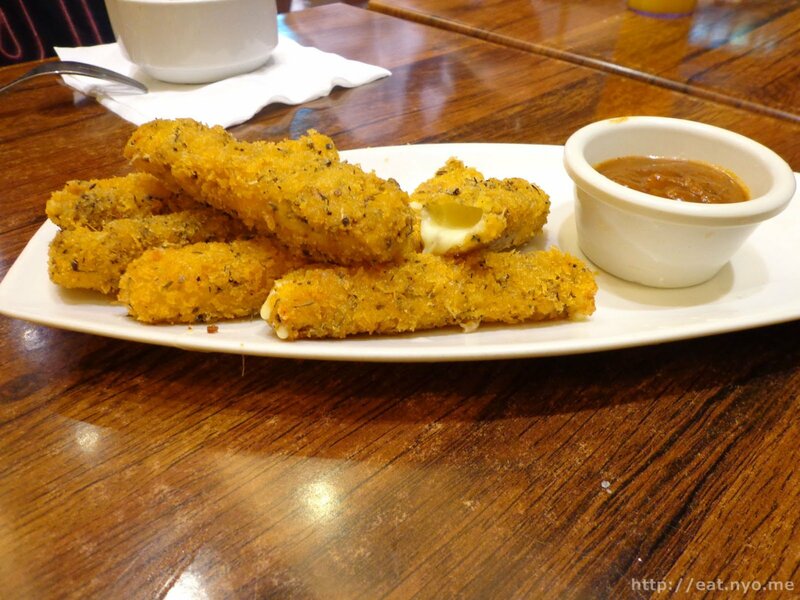 Oh, and we also got a couple of appetizers: their Mozzarella Sticks (155 Php) and Shrimp Diablo (168 Php). I’m pretty sure the Mozzarella Sticks arrived first, but since this is what the place is about, I’ll start with my order. The Everyday Platter B consists of one-fourth of an entire Peri-Peri chicken, which I asked to be cooked mildly spicy, Java rice, and a couple of breaded fried shrimp. For its price, I thought it was a decent deal. I got the upper quarter of a chicken, with breast and wing, and I personally wouldn’t classify it as “mildly spicy”. Since another friend ordered the same platter, I thought maybe our orders got switched, since he asked for the hotter variety. I found out it was correct since his was certainly spicier. I’ll admit that the chicken was quite moist and tender, and I quite liked it. However, I couldn’t agree with the shrimp, which turned a bit too tough. The crunch and also spicy flavor was acceptable, though. Oh, and they also served a ramekin filled with corn and carrot kernels, which I actually did enjoy. Beloved’s platter was similar to mine, just replace the shrimp with croquettes. Apparently, this was some sort of battered and lightly fried white fish. Beloved got the lower quarter of a chicken, and asked for the garlic-lemon variety, which she describes as “lemony”. The first of our appetizers, the Mozzarella Sticks, was actually appetizing, especially since it arrived before our main courses. These six sticks of breaded and deep fried mozzarella wasn’t the best value among its competition. However, it was among the better tasting ones, with the breading and sauce providing some spiciness. The second, the Shrimp Diablo, arrived after our main orders, so we were already getting full before having the opportunity to try them out. Luckily, they also served their purpose. Devoid of anything inedible (tails) and very spicy, these bites of deep-fried shrimp were actually very meaty in texture, a same texture I was hoping to find with the two included in my platter. The spiciness was what made it very appetizing, allowing me to finish all the food I ordered, including this and our mozza sticks (which I shared with my friends, mind you). According to my math, I had to pay 891 Php for the lot. I thought it wasn’t bad at all for the amount of food we had. 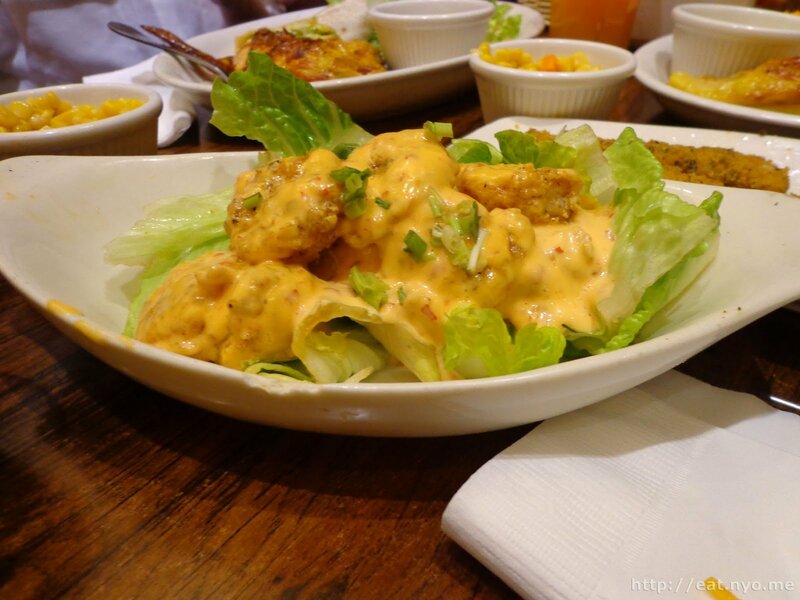 Certainly, this place might appeal more to spicy food lovers, but it’s certainly the good kind of piquancy where you can actually enjoy the underlying tastes and textures: the moist chicken and meaty shrimp (Diablo) in our case. Oh, and I also like the drink choices they offer with the 49 Php unlimited add-on, which I guess I didn’t really write about. Aside from the usual iced tea and sodas, they also offer mango, four season, and pineapple flavored juices. The soup, which I firmly believe any good restaurant should offer on the house (that or hot tea) was also a pleasant touch. Peri-Peri certainly was a pleasant “worth a try”. Location: SM North EDSA Annex Upper Ground Floor. Budget: 250-300 Php per head. 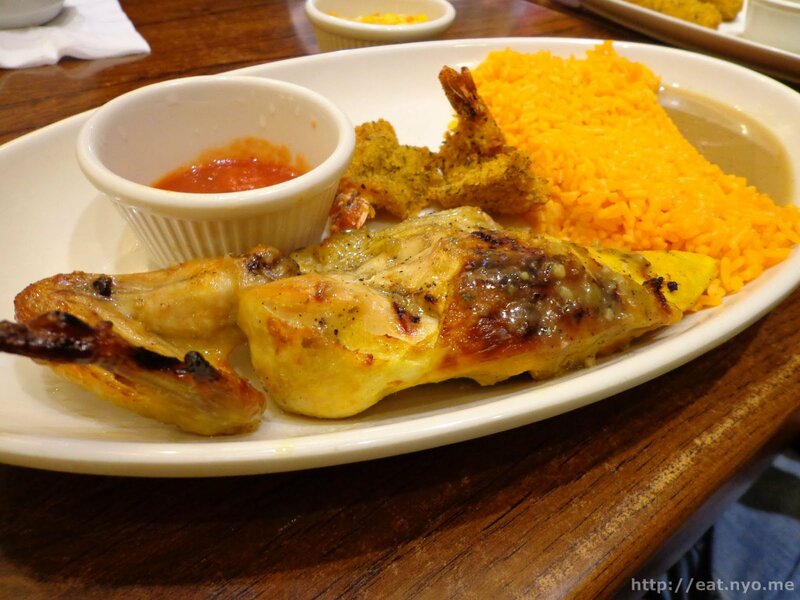 Recommended for: Hungry grilled chicken lovers. Not recommended for: Not-so-hungry grilled chicken haters. Smart nomnomnom tip: They have a “Light” platter devoid of rice. Take note of the quotations.